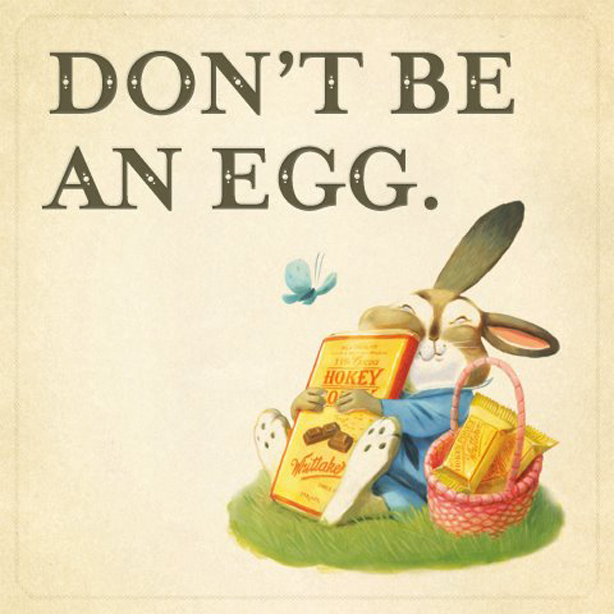 Presumably an advertising campaign for the Easter period showing a recent addition: that New Zealand classic hokey pokey, which is more often seen in ice cream, but reconfigured as a chocolate flavour. 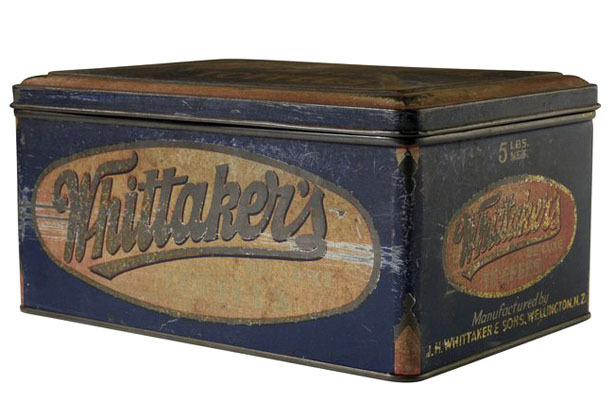 Whittaker’s is now one of New Zealand’s most popular (and enduring) brands, having been around for over 120 years – if you count it in its most primitive initial form. I love this brand, and enjoy it regularly. There’s so many things about the product that has appeal besides it’s “home-grown” quality, packaging, and advertising. Giving you the (sticky) finger: the only Whittaker’s advert I’ve ever found. Even then there was a company ethic with focus on local labour and supplies. Evening Post, 1932. 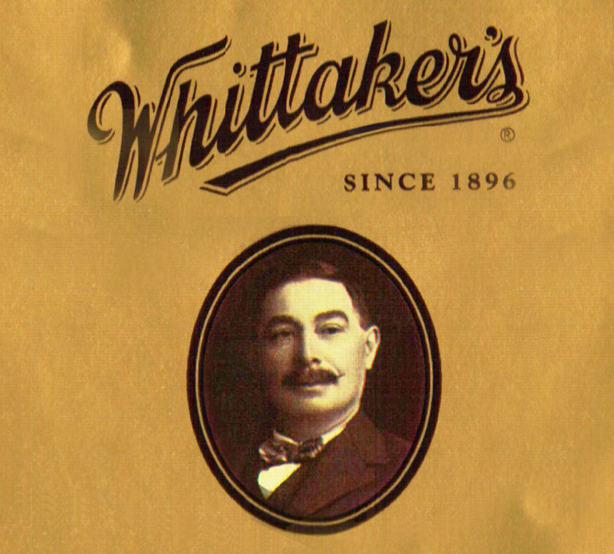 However the essential one is that Whittaker’s has a truly unique flavour that comes from their personal supervision over the entire process – from beginning to end, or as they have dubbed it – “bean to bar”. 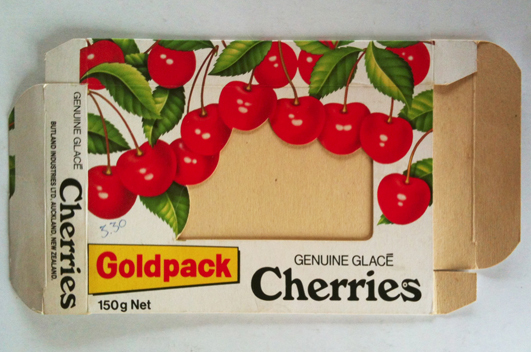 It must be one of few brands still make their product on site, Sadly here in Australia, where I currently live, we get a tiny portion of the delicious range – perhaps five or so flavours of the Blocks and bars, three types of Slab, and a couple of the bags of Minis which have been recently launched. No kiwifruit, no biscuit & berry, and definitely no raspberry and white chocolate! 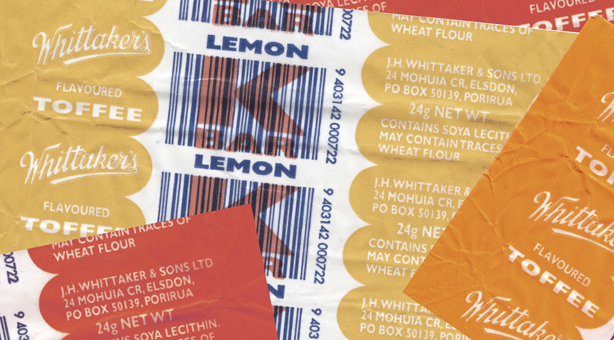 A portion of the block wrapper featuring J.H. Whiittaker. It’s true that their fraction of the Oz market is tiny and by accounts still in the single digits (but slowly growing). So I am not criticising, except to suggest if they had a bigger selection of varieties of their deliciousness on sale, for one I would buy more. I’m rather expressing my surprise that, although they are now NZ’s second biggest chocolate brand next to Cadbury’s, and have one of the neatest websites around, it’s an understatement to say that they have the usual thin-on-the-ground company yarn in their history section. I mean, minimal is an understatement – it’s almost nonexistent. Once I started looking into it, I found that there’s more back story there that they have skipped over in the happy-go-lucky one they present. 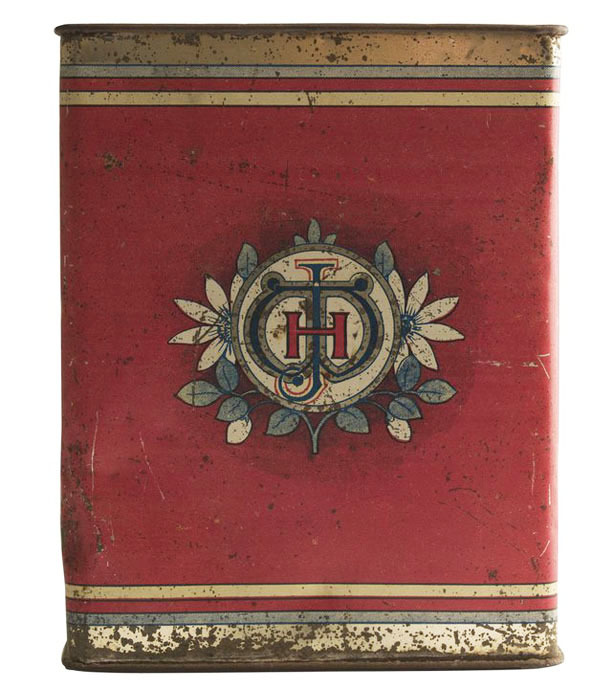 Tin from the Whittaker’s company archive collection, unknown era – presumably 1900s-1910s. James Henry Whittaker was born in 1868 in Longsight, Manchester to parents James, who was registered as a tool and model maker , and Annie. His two older sisters Harriet and Mary Ann were born in 1856 and 1858 respectively, as well as his Brother Walter who was born in Levenshulme. There is also mention of the family residing in Chorlton-upon-Medlock at this time so by all accounts they moved around the Manchester city area with regularity. 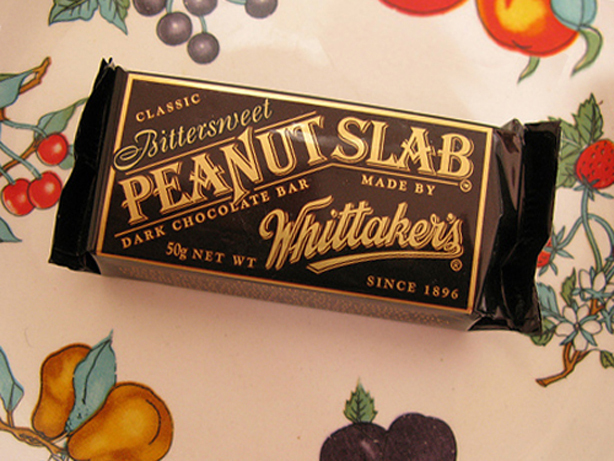 Classic Peanut Slab (which also now comes in two other versions). – photo courtesy of Viernest on Flickr. Following this the family moved again to Macclesfield, West Cheshire, a distance to the south where four more siblings were added; Charles Herbert (1870), Frank (1874) , John Frederick (1878 ), and Harold (1880). Having picked up and moved again By 1881, we find James working as a jeweller’s errand boy in Warwckshire, Birmingham and family is living at 14 Burbury Street there. The Exchange Building in Lambton Quay, Wellington, circa 1890s -which housed the home store of Rigg & Whittaker, J.H.’s joint business venture between 1892-1896. 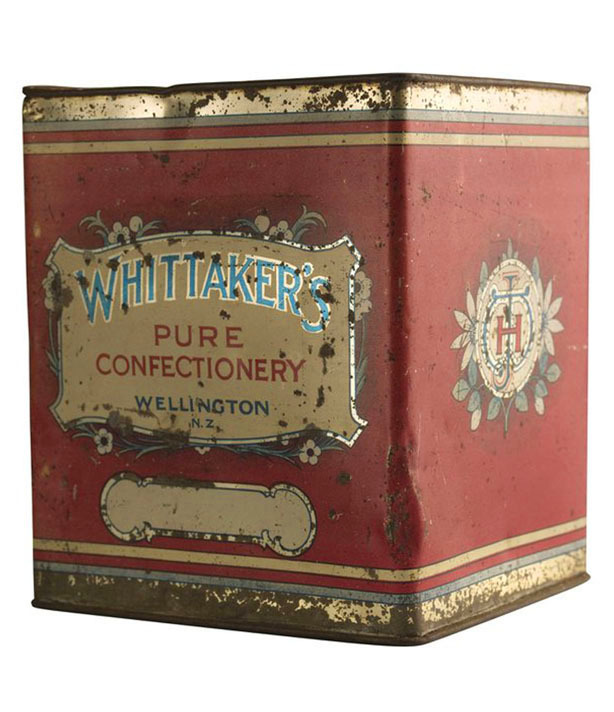 By 1883, or 1884 at the latest J. H. Whittaker entered the confectionery industry . It is mentioned that he worked for Cadbury’s, and as it happens that company purchased Bournbrook Estate nearby in 1878 and opened a huge Bournville factory to manufacture their cocoa and chocolate products. So we can safely say that sometime between 1884 and the following six years Whittaker worked for them and learned the trade inside out. 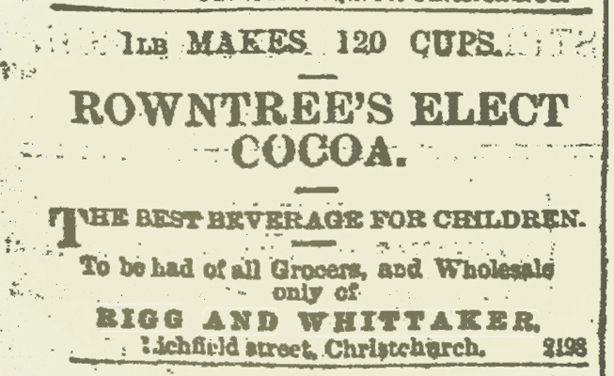 Advert for Rigg and Whittaker’s Christchurch store, agents- Press, June 1892. At age 22, he married Leah Alice Hopkins (born 1870), at All Saints Church, Kings Heath, in March of 1890. Sometime soon after this he left Britain for New Zealand, arriving before the end of that year. Records show only one J.H. Whittaker leaving from the Liverpool Port that year. He settled in Christchurch in the South Island and immediately set to work making his own product which he sold door to door by horse and cart. Brian Whittaker (top) and Andrew Whittaker (bottom) as children, and founder James Henry Whittaker, with portions of block and slab. Wasting very little time establishing himself , by 1892 he had entered into an import and agency business with John Rigg in Wellington, (not to be confused with the Hon, John Rigg, the well-known unionist who spent the majority of his life in the printing field. This one probably arrived to the country in the late 1850s and worked as an auctioneer and then later for the Wellington Council as a clerk). 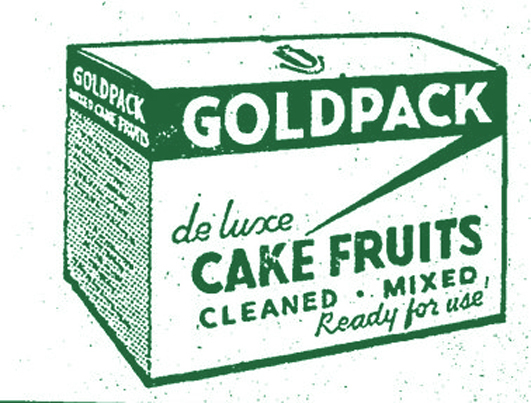 They were principal agents for Rowntree’s cocoa and confectionery in New Zealand – as well as Carr’s biscuits , Bottomley And Son confectionery and numerous other groceries and household wares. 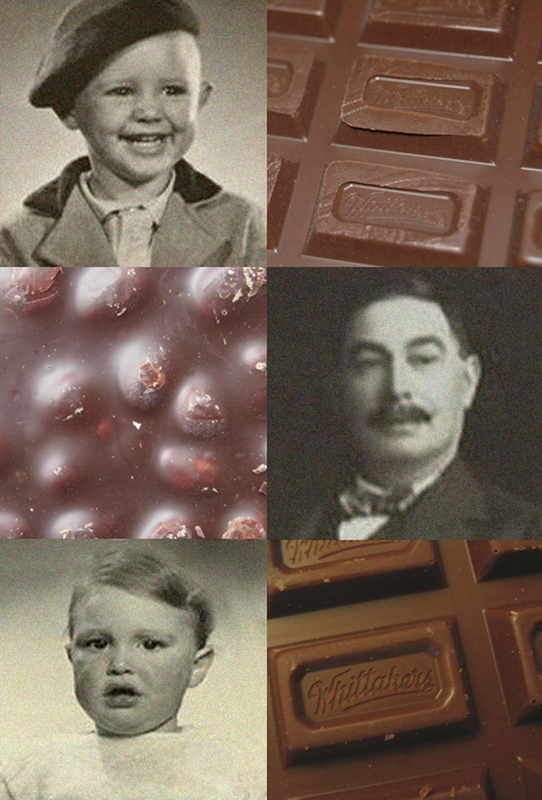 The former is no surprise given his professional background with the chocolate industry and this endeavour probably set him up well for what was to come both in knowledge of procuring the suppliers he would need, details of import- export regulations, and familiarity with the capital city and potential customers. 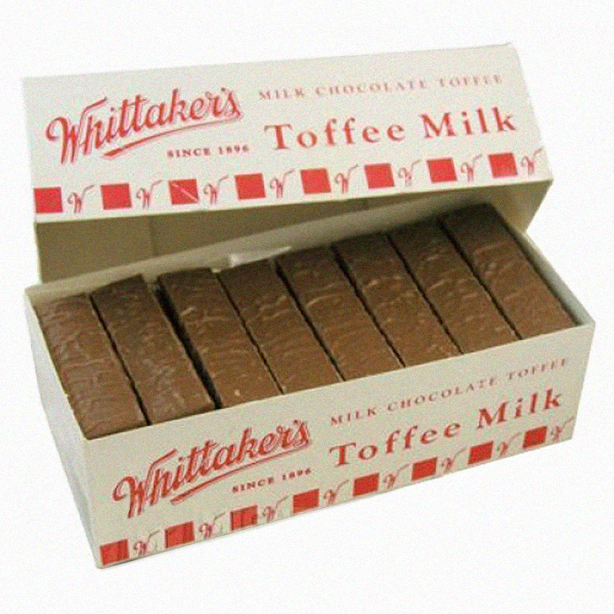 Toffee Milks are considered one of the three classics of the Whittaker brand along with Peanut Slabs and K Bars. This is the handsome contemporary version of the point of sale box with 72 units. The main business ran out of the Exchange Building on Lambton Quay where they were also agents for the Bank of New Zealand. their storehouses are described as ” always well stocked”. 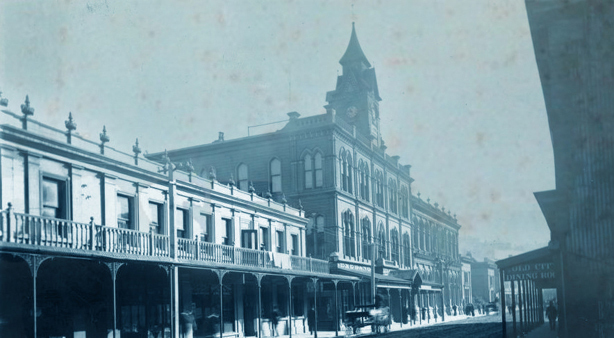 John Rigg’s Auckland business remained under his name and they established two more businesses – in Dunedin and Christchurch. Rigg & Whittaker were still a partnership in 1894, as exemplified by an advertisement for their business selling empty tin lined cases and casks on the cheap. I am assuming that these were probably the containers left over from there imported cocoa. “The rapid and complete manner in which the manufactures of the above named firms have been placed on the New Zealand market is not only sufficient comment on the ability and energy of these gentlemen, but proves that there is a market in this Colony for a really high class article, which they supply”. 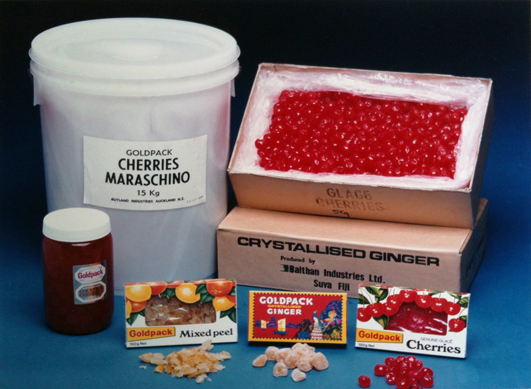 High class supply, superior standard product, was to become a theme of J.H. Whittaker’s business endeavours. The Whittaker’s Confectionery Works staff in Wellington, 1930. John Rigg continued on in this business well into the 1920s solo, with a record of 1922 showing him importing perfumes from Europe. 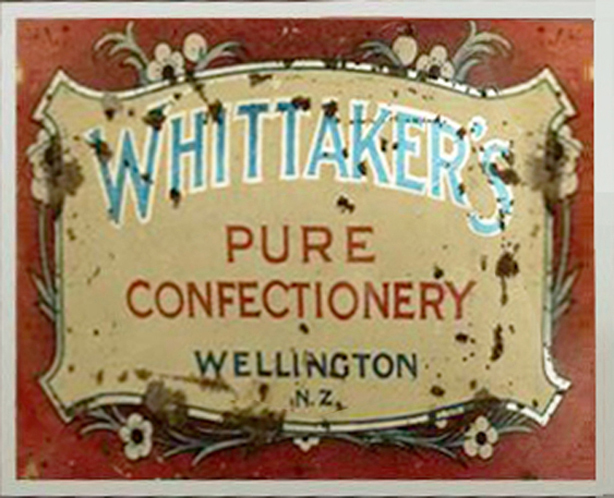 However sometime during 1896, Whittaker, residing in Wellington at least temporarily – had parted ways with Rigg and established Whittaker’s Confectionery. A Kiwiana classic: top side of the Peanut Slab, synonymous with school tuck shops of the 1970s-1980s. Photo courtesy of Molly D from Dark Chocolate Diary. In 1897 he seems to be back in Christchurch with the business there, so there’s a possibility that he took the Lichfield Street branch of the business with him in the deal when he and Rigg parted ways. 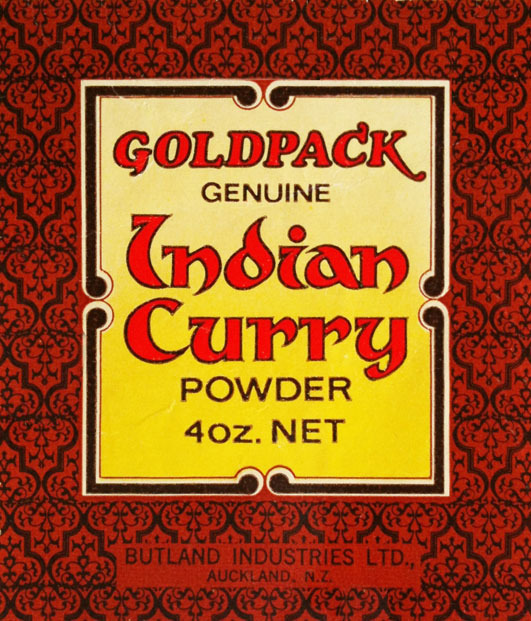 So with the distributing manufactory in Wellington up and running, he also ran the business in Christchurch for the next 16 years, listed as being at Lincoln Road, Addington (1904). 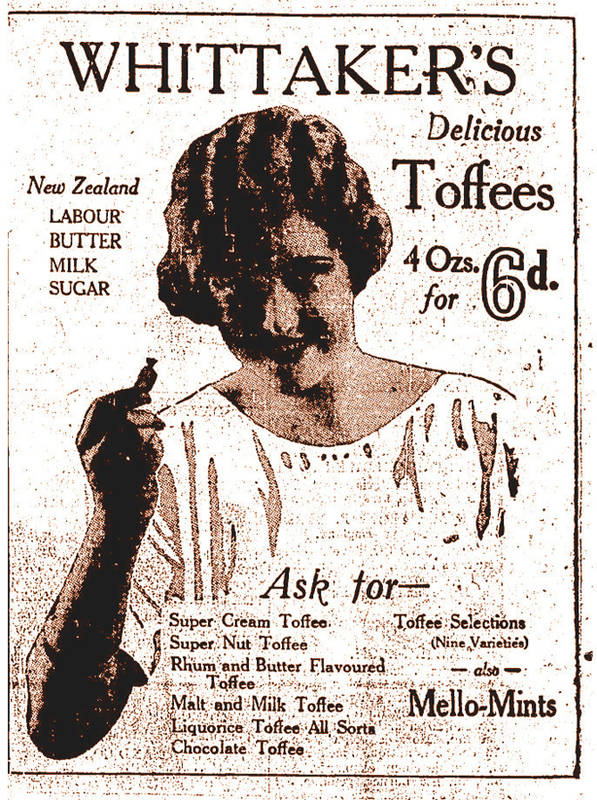 The earliest definite records I can find of Whittaker branded product is caramel toffee, and mint toffee in the 1910s. Recently, a printed earthenware jar surfaced showing that at least in the early days of the company – they were also producing a jam line. 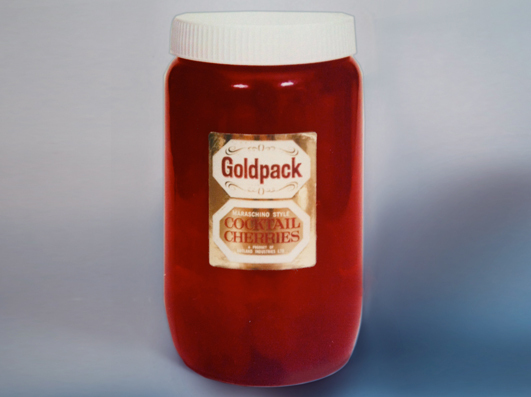 Pretty typical for many confectioners to have a number of preserves and sauces in the early days; it just went hand in hand with the cooking processes. The jars which are known to come in two sizes, 14.5cm and 9.5cm respectively, are extremely hard to find with less than ten known to exist, so likely it was produced in small quantities – hence the scarceness of this item. Emblazoned with “Whittaker Brothers“, it turns out that two of his siblings worked in the confectionery and importation business with him under that name (but were not financially involved in the enterprise). One source says Walter and Charles – but it’s likely that it was actually Charles and Harold – as their names appear on electoral records for the 1905-1906 years in Christchurch alongside Henry James’s. At the same time a Walter Whittaker appears in Canterbury. I was unable to find definite shipping records for any of the three to confirm what year they may have followed James Henry over to New Zealand- but they probably all came over separately and some time between 1900 and 1905. 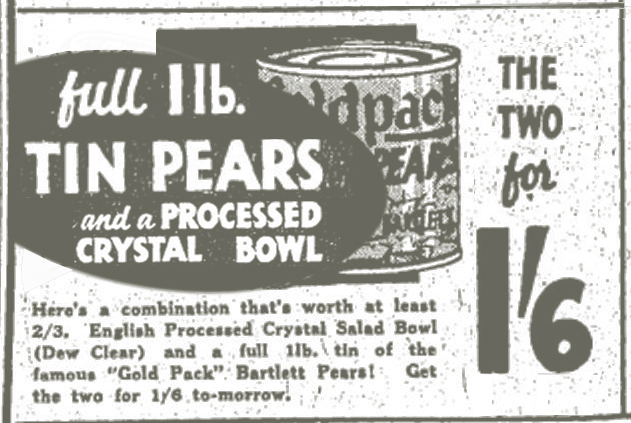 These barley sugar tins crop up at auction every two or three years, so still quite hard to get. 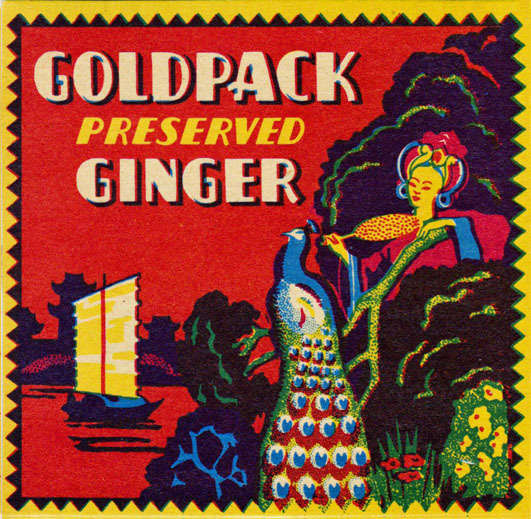 A similar tin was also made for Glucose Butterscotch. I’m guessing 1950s. Over the first 20 years of their marriage James and his wife had a total of nine children; five boys and four girls, including twins . However it was in 1913, that he established a partnership with two of his sons, Ronald Tawhio Whittaker (1893), and James Whittaker (1894).A curious consideration here is their age – they weren’t exactly experienced – the oldest not being more than twenty. The modern K Bar point of sale box still has a classic design and holds 48 units. This is where things get interesting because during the same period, I found that James Whittaker filed for bankruptcy . This was the same year that he had formed J.H. 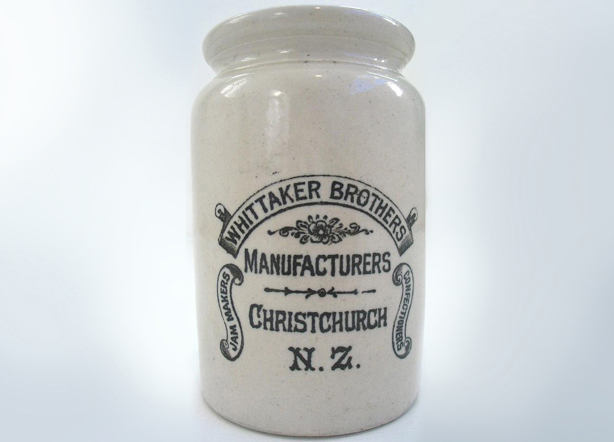 Whittaker & Sons in Wellington with his offspring – this is the Whittaker’s we know and enjoy today. These apparent financial woes occurred when he had now been in the confectionery business in Aotearoa in some form or another for over 22 years. 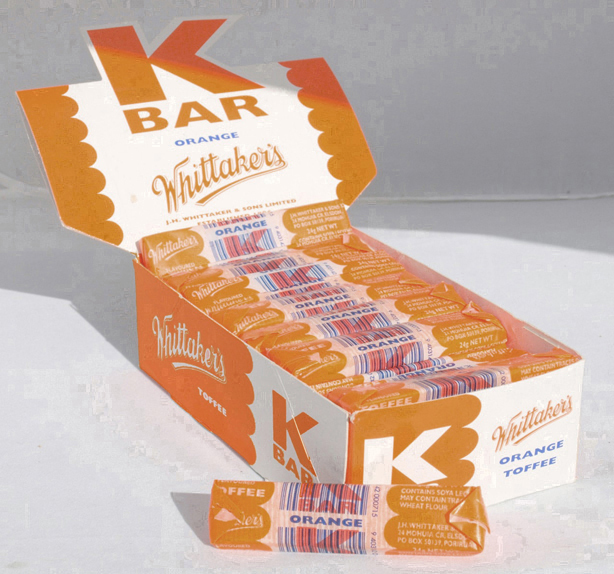 Doing classic well: Another view of the modern K Bar point of sale box. I had to wonder, was this a coincidence, or whether this was deliberately orchestrated? This is the reason for my curiosity. In his sworn statement at the Supreme Court hearing of his case, he explains that his business in Christchurch had been troubled for more than five years, and one of the reasons he provided for the cashflow problem was that because business was bad – he had to pay more costs for promotion and travellers (agent salesmen) “in the north (island)”. 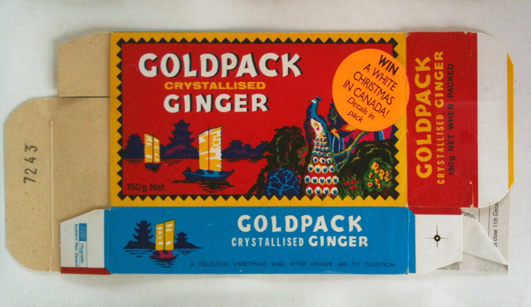 The design and wrappers have not essentially changed since the 1970s. Yet he had deliberately infiltrated the North Island and created an enterprise which became the base for the others (there’s a possibility that he may have had more shops than just the one in Christchurch). He had funneled money into another business and it had affected his available resources and viability. It was by no means a sudden event. I was able to find the 1908 act under which he was adjudicated, Apparently it seems that filing for bankruptcy did not affect a partnership since he was filing bankruptcy for his Christchurch business, which was not a partnership. Neither of the sons filed for bankruptcy…in fact one of the sons in the Wellington partnership was listed as a creditor. I’d take a guess the whole thing was part of a long-term plan and also just happened to serve the dual purpose in neatly extracting him from a (possibly calculated) financial fix and thus nicely moving things along in the desired direction. No longer responsible for paying the salary for his two partners under Whittaker Brothers, he apparently moved the remainder of his family to Wellington to focus on Whittaker & Sons and his siblings remained in the Canterbury area for the rest of their lives. The extremely rare Whittaker’s jam jar. Only about ten intact examples are known. “Brothers” indicates it dates between 1900-1913. Jam historian Peter L. Henson says – “like jam maker Robert Furness of Auckland, these pots were probably imported from C.T. Maling of Newcastle Upon Tyne. Maling captured the market for the production of white pottery with transfer-printed trade labels and was a leader in domestic white ware, being responsible for supplying 90% of the jars for jam makers in England and Scotland, together with exports.” Photo courtesy of Steve Costello. The Whittaker Confectionery Works was situated at Cornhill Street between at least 1913-1916 when they advertise variously for “a capable young woman, good organiser…boy for warehouse…girls for wrapping… experienced sugar boiler”. 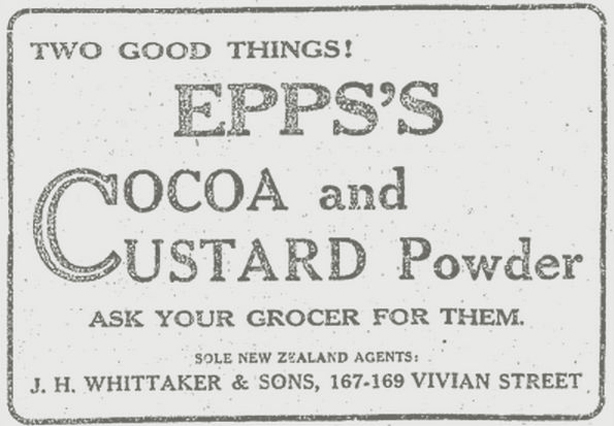 At this time Whittaker’s acted as agent for Lipton’s Tea and also for Epps’s cocoa, boxed chocolates and custard powder. By June of 1917 the works had moved to 167-169 Vivian Street and records show that’s where it stayed until at least 1945. What happened after that date is unknown at present, since records after that date are limited. Whittaker’s issued only five hundred units of this chocolate block featuring navigation buttons from the website. Pieces of the bar were broken up and actually used for the design of their on-line presence. The Whittaker company’s rising fortune meant a move back to “the big smoke ” and that’s where J. H. Whittaker was again by at least 1927, which finds him involved in various organisations such as the City Ambulance Board, the Brooklyn School Committee, the Wellington Civic League Council , and the Birmingham and Midland Counties Association of which the last two he was president. Now in his late fifties he was nearing retirement age and seemed to settle in the Wellington suburb of Brooklyn with his wife for good; first at 40 McKinley Crescent by 1935 and then two years later at Todman St. Also in 1937 the business became a limited liability company (a flexible form of enterprise that blends elements of partnership and corporate structures). Founder J. H. Whittaker died 1947 and his wife Leah a few years later in 1954. 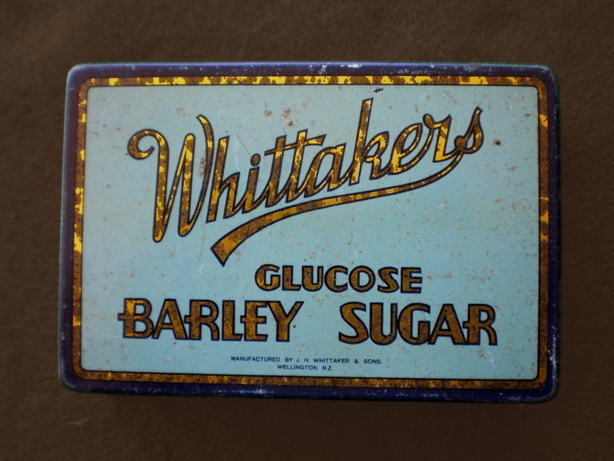 As well as their own confectionery business, Whittaker’s acted as agents for Epps’s and Lipton’s. Known products of the 1930s were chocolates, glucose barley sugar, liquorice toffee allsorts, and Mello-O-Mints. 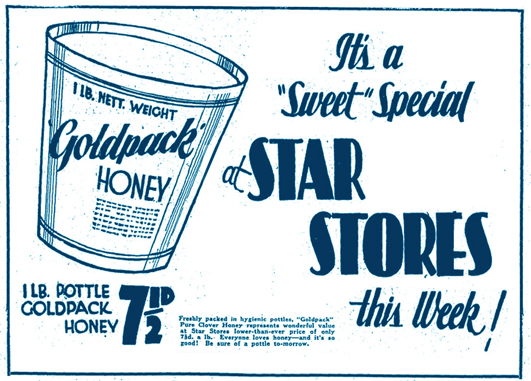 Toffee was a big thing for them even back in those days – and varieties included super cream, super nut, chocolate , rhum (sp) and butter, malt and milk, and “toffee selections” – a mix of nine varieties. What their chocolate products were specifically at the time – I don’t know as I have never seen any packaging or ads, in fact vintage Whittaker’s is extremely rare. 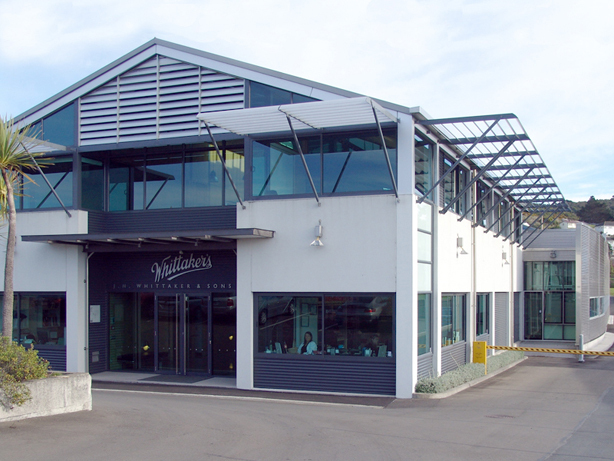 Whittaker’s factory in Porirua showing the very smart pod extension (below) designed by Craig, Craig, Moller / Tony Johnston – Architects. 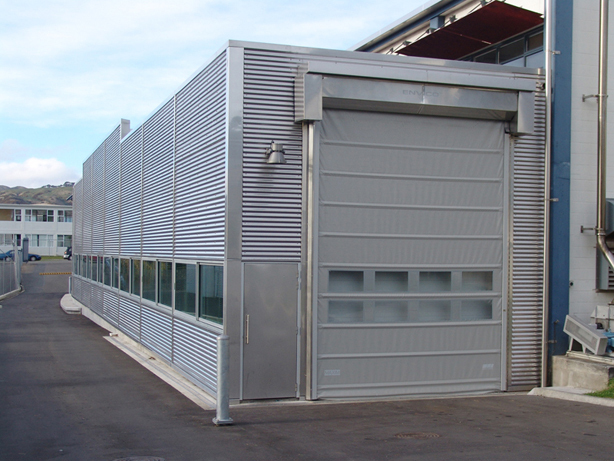 Constructed by Turnat Commercial while full production carried on unimpeded. It was not all fun and games working in a confectionery factory though; far from it. In 1938 Miss D. Pritchard suffered severe lacerations when she caught her hands in a chocolate machine., and in 1943 Miss C Incledon lost three fingers in a toffee rolling machine. They seemed to be constantly advertising for staff over time, if only replacing digits was that easy. 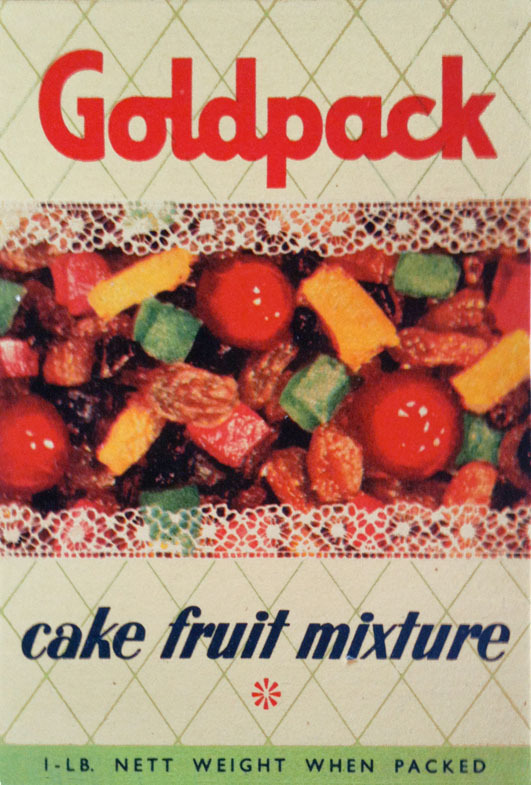 The 1960s saw fruit mixed toffees, Koff Caramel, and Karamel Bars. Santé probably came along much earlier in the piece but Whittaker weren’t the instigators by a long shot – it was almost generic being produced by Fry’s , Hudson’s, Masson’s, Griffin’s for the Sweetacres line, and Beatall at various times from the 1860s onwards. However in time, Whittaker’s made them a brand name associated with their company alone. Three flavours of Santé – photo courtesy of Marib on Flickr. 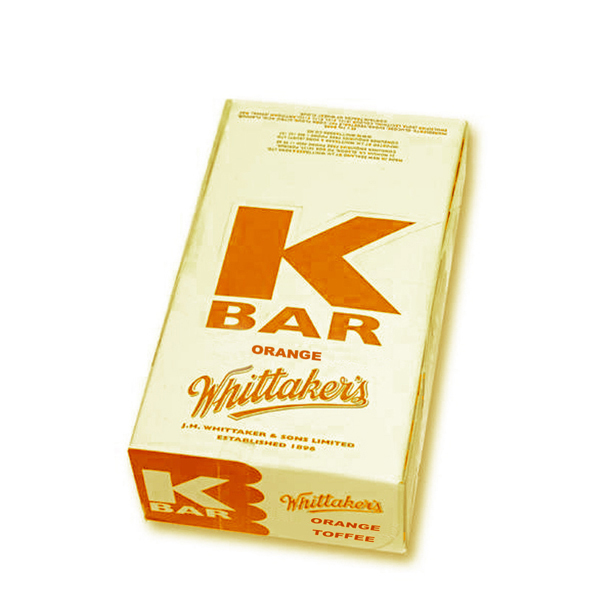 The Gen-Xer heyday, my time, was the 1970s to 80s and consuming what are now considered the classics: Toffee Milks, those old “tooth pullers” K Bars (orange, lemon, lime, raspberry, pineapple, blackberry fruit toffee) and Peanut Slabs. Say the words “tuck shop” to anyone of that era and their mind will likely go to these three, now iconic, products. I did have pictures of a classic 1970s Toffee Milk box as well as a vintage cast iron Santé mould, but seem to have misplaced the pictures – which is unfortunate as any images of vintage Whittaker’s are far and few between – and they would have been great to illustrate this article. An ad for an upcoming release that is getting hype and salivation at present. No word on what date it will be in store yet. Products of the nineties that disappeared along the way were Nut Block, Peanut Block, Peanut Hunks, and Sport. In 1992 the company made the beginnings of a trans-Tasman play when they formed J.H. Whittaker Australia Ltd. , making it one of a handful (Four Square, “K” Brand, Aulsebrook’s, Sharpe Bros and Glaxo naming a few) that have successfully established themselves over the ditch. 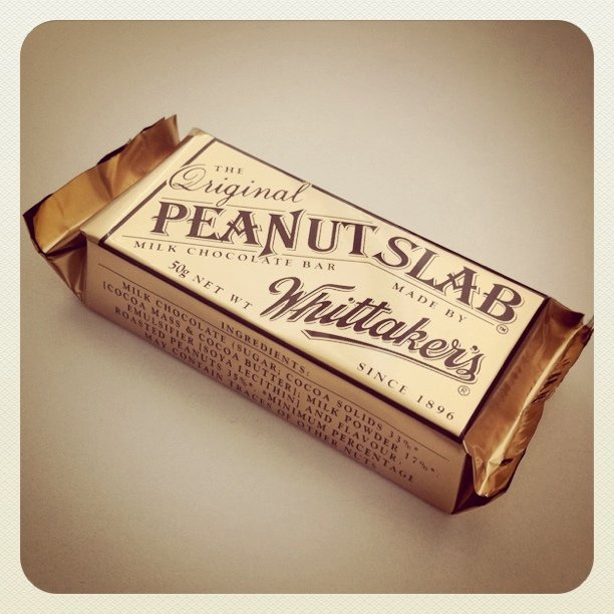 Bittersweet Peanut Slab, photo courtesy of Moira Clunie from An Auckland Vegan blog. 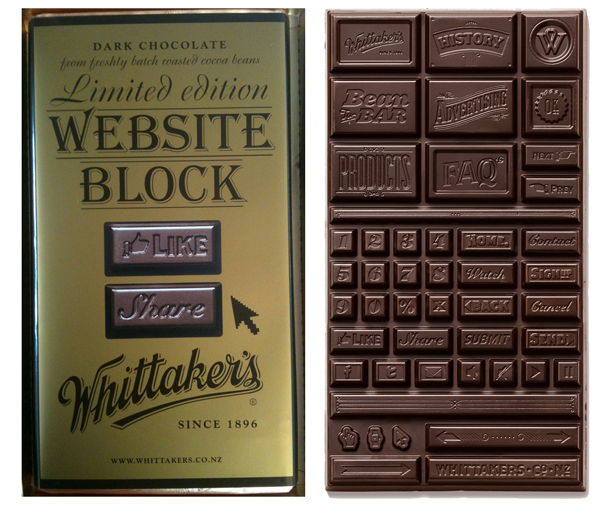 In July 2011 Whittaker’s launched their impressive completely themed website by Wellington digital design agency Salted Herring, with the by-line that it was “the world’s first made entirely of chocolate” (not really, well – kind of) and launched a matching limited edition block which was comprised of the website interface elements made in real chocolate. Once the mould had been created, the dark Ghana navigation buttons were photographed and uploaded to become part of the design. 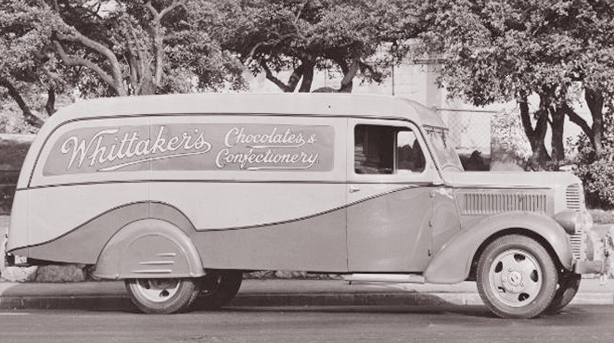 Whittaker’s Chocolate Works Fargo delivery truck 1938, courtesy of the Porirua Historical Society. Today James Henry Whittaker’s grandsons Andrew and Brian manage the company, with a focus on “fairness” – fair trade supplies and local employment opportunities, an idea that they were advertising back in the 1930s. The range is extensive . It comprises of all the classics I remember fondly from my youth as well as chunks, squares, bars, Slabs in eleven flavours, Santé in four flavours, Santé three packs, Slab bars in four pieces including new hokey pokey, Slab three packs, Mini-slab bags in nine flavours. There are around twenty five different varieties of blocks including an upcoming peanut butter version, as well as a brand new white raspberry flavour in store within the next few weeks. 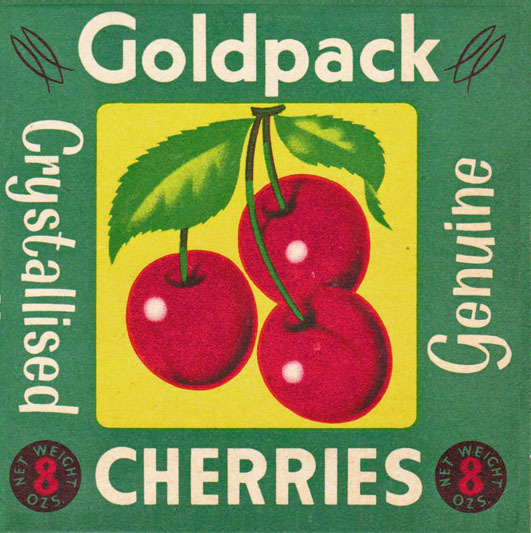 Tin from the Whittaker’s company archive collection, unknown era – presumably 1930s. 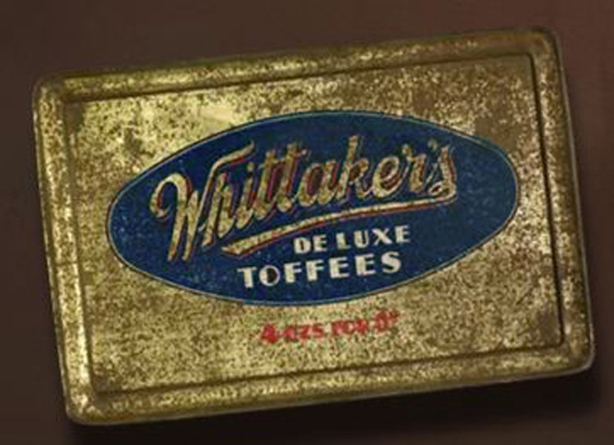 Whittaker’s is still made entirely domestically from beginning to end today, at their Porirua factory. 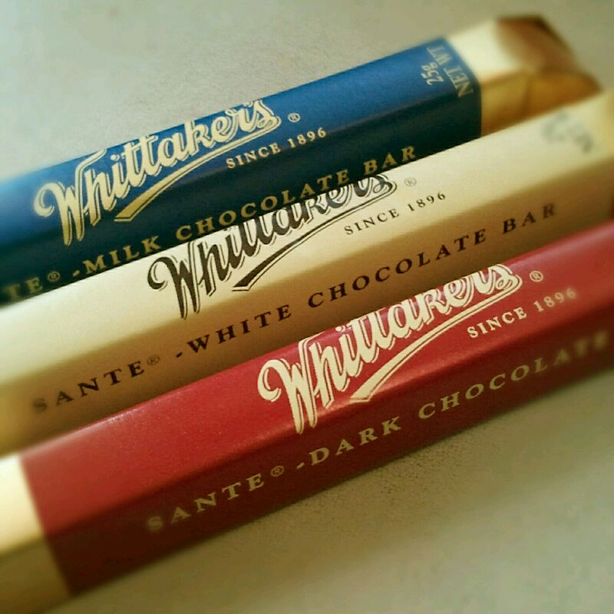 In 2009 Whittaker’s was the third most trusted brand in NZ according to a Reader’s Digest survey, and by this year topped the list as most trusted brand ahead of Wattie’s and Cadbury’s. It even beat out St John’s Ambulances. Maybe chocolate is the real life saver after all. 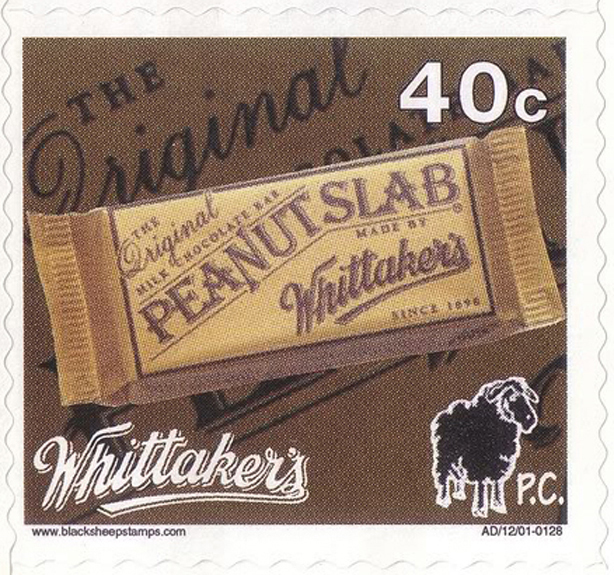 Whittaker’s had a, now collectible, official stamp created by company Black Sheep in 2001. 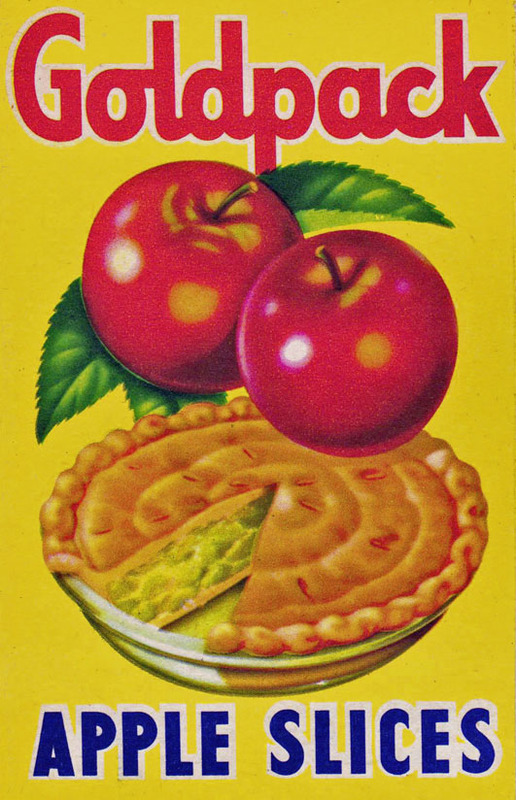 Addendum, late November 2012: The Whittaker’s company recently released some new images of vintage packaging from company archives. It gives a more complete vision of what, as it turns out, were the lids of two canisters that I previously posted above. I thought they were flat tins, sort of like the barley sugar one – very similar to the type of flat container that tobacco was sold in. As it turns out, they were far more substantial. I presume the “boys And Girls” graphic is a POS or a section from a peanut slab box – that’s what it looks like in the character’s hand. Originally a British brand, Wall’s started in Acton in 1922 and the business was such a success that by 1959 production had doubled and a large factory rebuilt in Gloucester. 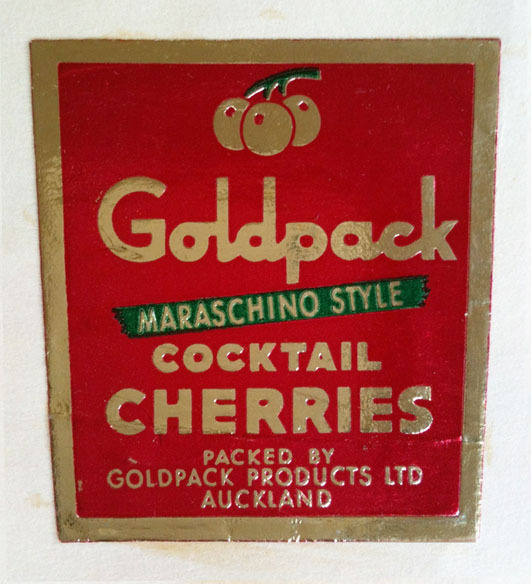 I would conject that the brand came to New Zealand soon after that – probably in the very early 1960s under the auspices of Unilever. I really don’t have that much information on the history of the brand in Aotearoa. Kiwis hold these sort of brands dear via fond memories of something they grew up with – yet the story didn’t really happen here; like many foreign concerns such as Cadbury’s that wheedled their way in to the marketplace via franchises or mergers – basically they just arrived and kicked some eggs out of the already-established nest, so to speak, to make space for themselves. 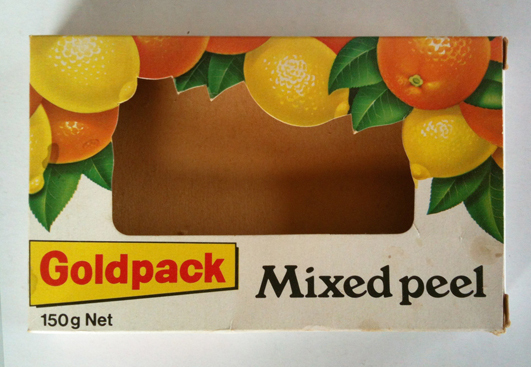 The first real records I have of specific products are Tahitian Delight (1961) and Sno Frute in flavours big orange, big pineapple, and big pink lemonade (probably late 1960s). By the early 1970s the brand is being marketed under the auspices of Birds Eye Frozen Foods NZ Ltd, a Unilever subsidiary which was present in New Zealand from 1947 – having Wattie’s produce their frozen fruits and vegetables for them under the Birds Eye brand, which I previously mentioned here in December 2011. 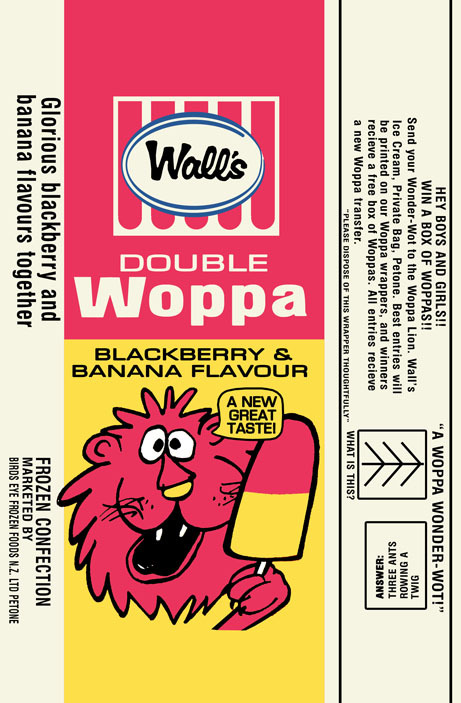 By the early-mid 1970s I personally have memories of the Woppa in blackberry banana flavour (I have recreated all the flavours that I am aware of, but I’m sure there were more over time). 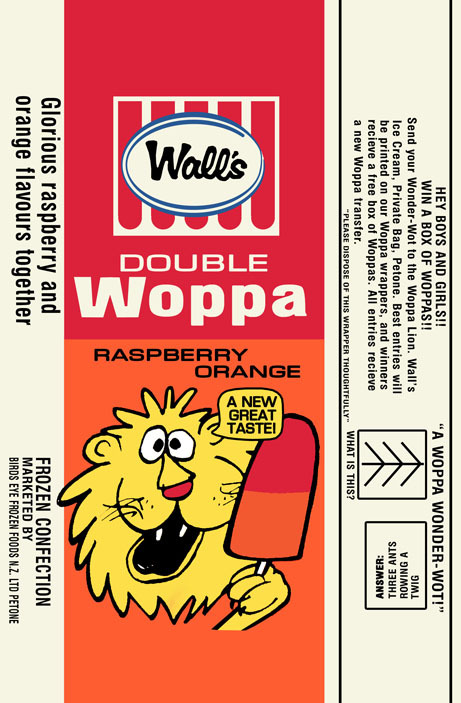 I also remember having Tornadoes and boysenberry Splices – but I think most people will be familiar with the very popular “Crazy Joe” character which they used for a cola flavour popsicle (or “iceblocks” as they were commonly referred to in Aotearoa) – he was also used in Australia and the campaign was pretty much identical from what I have seen. 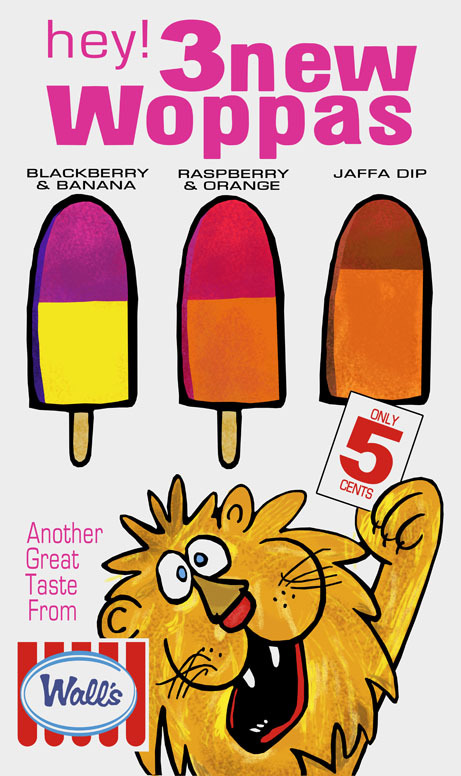 A big thing at primary school in the mid to late 1970s was the Apefruits range, based on the sensational Planet of the Apes hit TV series and the ice novelties came in flavours like Orangutang, Chocanana, Jaffanana, and Gorillaberry with a matching sticker set to collect (now competitively pursued by collectors). 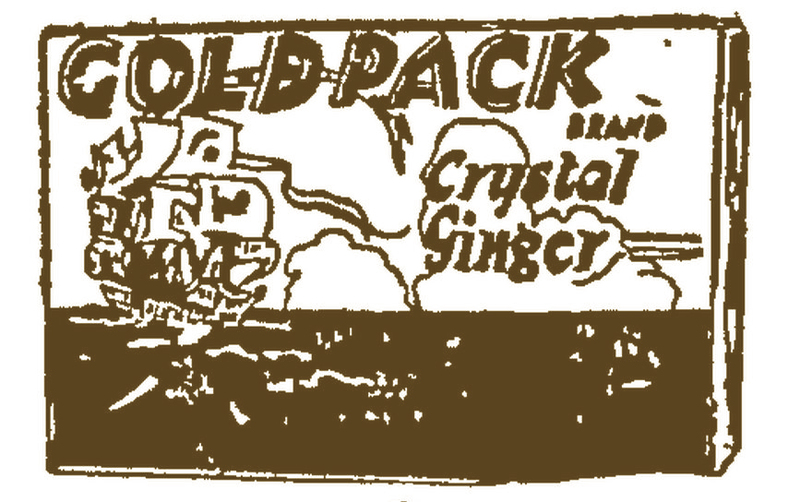 The brand pumped out novelty lines with no stopping through the 1970s and some of the names for products I have run across are Daisy, Spider, Sundowner, Fizzbang, Goblet, Weird Wolf, and Witchy Goo – specific years unknown. Wall’s Ice Cream Ltd it was purchased and run by the Rangitaiki Plains Dairy Company circa mid 1970s , for a brief period of time. 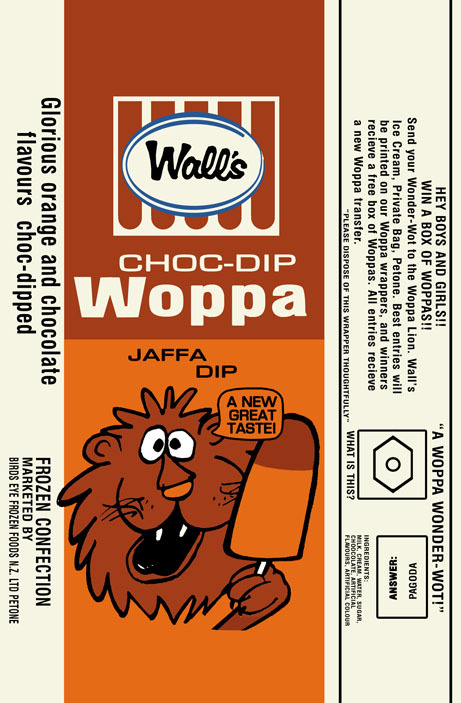 By the very end of the 1970s, the business been snapped up by that great subsumer of all smaller ice cream brands, Tip-Top – and seem to continue through the eighties to the end of that decade with products like Star Trek in1982, The Goonies in1985 (both based on the hit movies of the moment), and an America’s Cup “KZ-7” novelty in 1987. Presumably by the end of the decade, the brand was dismantled. I recreated the Woppa labels and the poster from different lots that have been sold on Trade Me over the years. In particular the wrappers were terrible quality and quite a feat, but not the hardest thing that I have done over the last couple of years by a long shot. 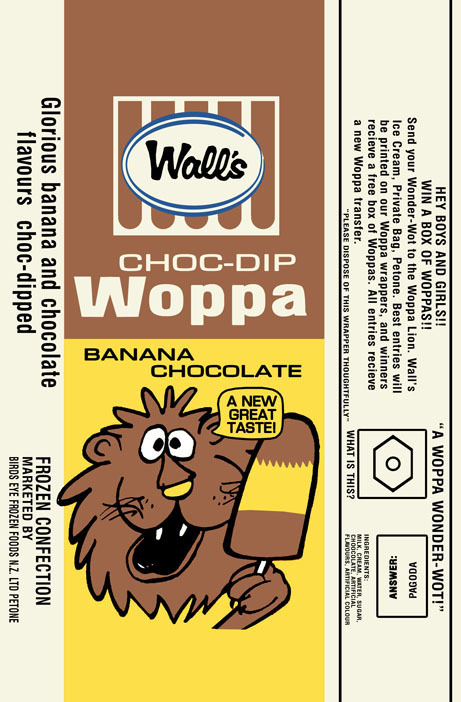 The flavours of the Woppas sound absolutely mouth-watering and I could have one now! 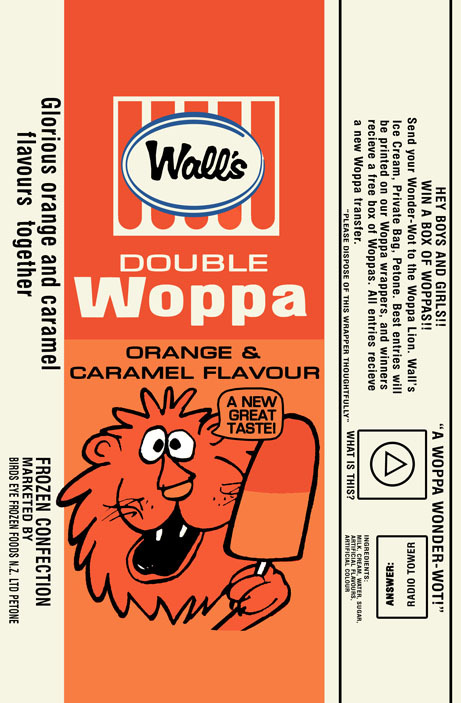 It looks like the brand in Oz was eventually subsumed by Street’s Ice Cream (obvious from the logos I have seen). However Wall’s products, still based in the UK , continue to be made today – apparently still a market leader with some products. It is still owned by Unilever in Britain and is now truly a global brand, just no longer in Australasia. The Woppa poster is available from my online store along with lots of other things. Greeting cards are a great deal!